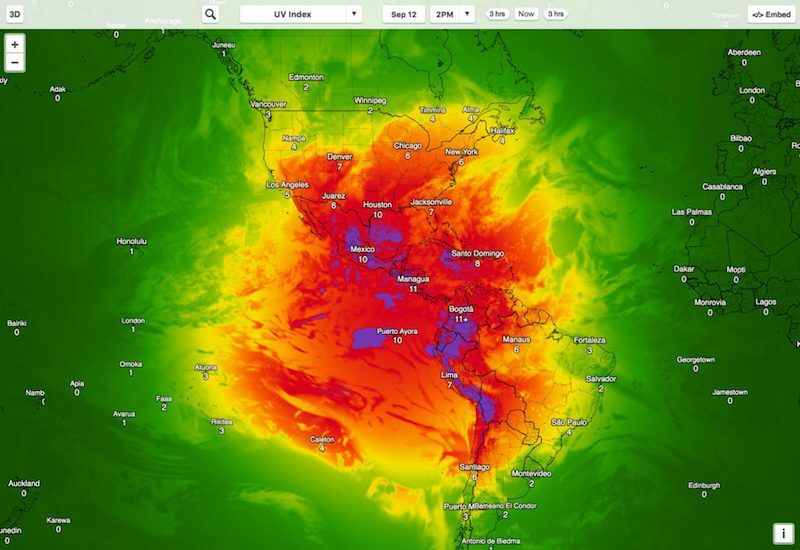 Weather forecast app Dark Sky has expanded its services to the web, with a full-featured browser site that offers much of the main app's pinpoint-accurate weather predictions and data (via Wired). Dark Sky co-founder Adam Grossman said the reasoning behind introducing a desktop site for Dark Sky was for people who preferred not to take out their phone when sitting at their computer, but still wanted Dark Sky's accurate readings. On DarkSky.net, the first pieces of data showcase the temperature, a brief incoming warning about potential bad weather ("Light rain starting in the evening," for example), along with a 24-hour forecast. Wind, Humidity, Dew Point, UV Index, Visibility, and Pressure are also all listed at the top of the website. A large local map takes up the center of the page, and can be customized to show visuals like Temperature, Precipitation, Wind Gusts, and more. The bottom of the site houses the weekly forecast, where users can click on each upcoming day for a more in-depth breakdown of the coming week. There's even a "Time Machine" feature below the weekly forecast that lets users jump back or ahead to a specific day and check out all of the expected weather data that happened, or will happen, in its 24-hour span. Grossman said it's easier to experiment with things on the web, so the company has thrown in a few new aspects of Dark Sky, like microclimates, which could potentially come to the iOS and Android apps one day. If users check out the Grand Canyon, for instance, they can zoom down and see how the temperature changes as they descend. The website does lack the mobile app's well-known notifications -- which give weather warnings ahead of time -- due to "less reliable" notification data and GPS location tracking that's "harder to pin down." Some additions that are downright clever. Whereas Forecast.io only showed a precipitation map, the Dark Sky site’s maps are situationally aware. If you head there on a potentially snowy day, for instance, it will automatically know to serve you an accumulation map. Even the precipitation maps have gotten more refined. If it’s going to rain soon, you’ll get a detailed radar view. If there’s rain nearby potentially heading your way, Dark Sky will load a bigger picture view. The new site is said to be a bolstered version of the company's previous desktop site Forecast.io, although Grossman admits that they "made it as an experiment," and the new site is a better version. Also beneficial to users is Dark Sky's adherence to a no-advertisement policy, because Grossman and the team wanted to avoid pratfalls of other big weather websites that are "filled with ads top to bottom, and crusty links to other articles." Am I missing something? Why should I pay $3.99 for the app when I can go to the website? Real time notifications for precipitation. also quick look in notification center...etc. I paid nothing for the app when it came out long ago and to this day is still in my front page of my iPhone, its freaky accurate with sending you notification when the rain will start and you can see how long it will take for the rain to go down. I use it 99% of the time for that. I am also a "home screen" DarkSky user. Uh, what? This product? No, they just put up the website recently. Weather websites in general? Those have been available from many sources for many years (I would have thought that was obvious). This particular take on weather websites? Forecast.io was their first version, this is their second version. More of a rebranding than a new website. But nobody else is doing exactly what they are - synthesizing data together from a bunch of different networks of sensors/stations with their particular algorithms for correlating all the data. Nobody is doing exactly what anyone else is doing but that does not change the fact that the NWS/NOAA has been supplying point weather forecasts in one hour resolutions online for years. So while a lot of commercial repackagers are presenting this data in different and perhaps more interesting ways, it doesn't mean they are inventing new and better data or better forecasts. I love this app. Used it for years. I got it for the instant notifications. I hope they don't go south trying to fill two spots. This app is one where it isn't just a matter of translating all the English messages to German. It works because they're averaging together (well, that's a considerable oversimplification) a whole bunch of different specific localized weather sources/networks that are available in the US, and their algorithms for the "averaging" are specifically tuned to those US resources. Sure, Europe has state-run and personal weather stations, too, but they're unlikely to be arranged/associated in precisely the same way as the ones Dark Sky is using in the US. So, changing the on-screen text into German wouldn't be too hard, but rewriting their entire server-based weather collecting/comparing back-end to handle a non-US region would be a huge job - not just writing software, but doing the research into what all the weather station networks are and how to access the data, and getting the appropriate permissions to access all of them. I know that. But it's still a pity because it seems to be a damn fine app in the US. I haven't come across an app that has the same features like dark sky AND has such a nice UI (which is almost equally important to me). indeed, you are. native apps are more fully featured than web apps and execute faster due to compiled code and local resources.